I am an Algerian citizen, working as a computer scientist in Paris. I have been refused a tourist visa for UK for the second time despite having strong applying documents, good income, and a rich travel history(I gave all my boarding passes that includes flights to +10 EU countries + canadian visa) The reasons given seem absurd to me, and I really think they just don't want me to visit UK independently from given documents.  You state that you intend to visit the UK for 4 days and propose tourism. Am I not free to decide how long I want to visit the country depending on my budget and holidays given by me employer ? In support of this you have submitted your payslips, letter confirming employment and bank statements in French. It is unclear whether your employment is permanent, temporary or fixed term and whether your employer has granted you leave for the stated duration of your trip. I could have agreed with this argument, if I haven't applied with a colleague that has gave the same proof of employment as me(which was in french), and had his visa. Furthermore the visa application required documents are around 50 pages long, and it costs around 50€ to translate one paper, which means I have to spend 2500€ for translating document, this is ridiculous ! For my first application that has been refused too, all documents were in french and this wasn't the reason of the refusal(it was because I applied during summer as a student and I didn't have my new student card yet), they were able to extract information from the application's documents. The bank documents you have provided show large credits not commensurate with your documented income in the time leading up to your visa application. There is no explanation provided regarding the origin of these funds. 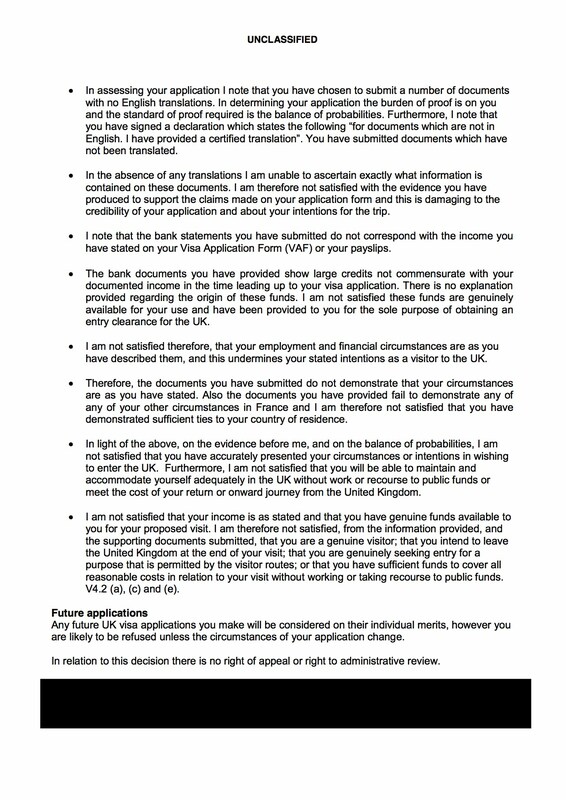 I am not satisfied these funds are genuinely available for your use and have been provided to you for the sole purpose of obtaining an entry clearance for the UK. I don't know what to say about this, I have other accounts where that a use to transfer money to for savings. I don't know what more I can do to proof that these funds are mine, since they are here in my account for years. Your visa was refused because, among other things, you failed to follow the instructions. Your supporting documents must be in English and any document that is not in English will not be considered. Since all your supporting evidence was in French, none of it actually supported your application. The visitor visa supporting documents guide is very clear on this. You state that you had "strong applying documents" but, in effect, you had no documents at all. You also included irrelevant documents such as boarding passes for flights you've taken and visas for other countries. Nobody needs 50 pages of supporting documents for a four-day tourist visit. A letter from your employer saying that you work for them doesn't need to be more than a page, for example. 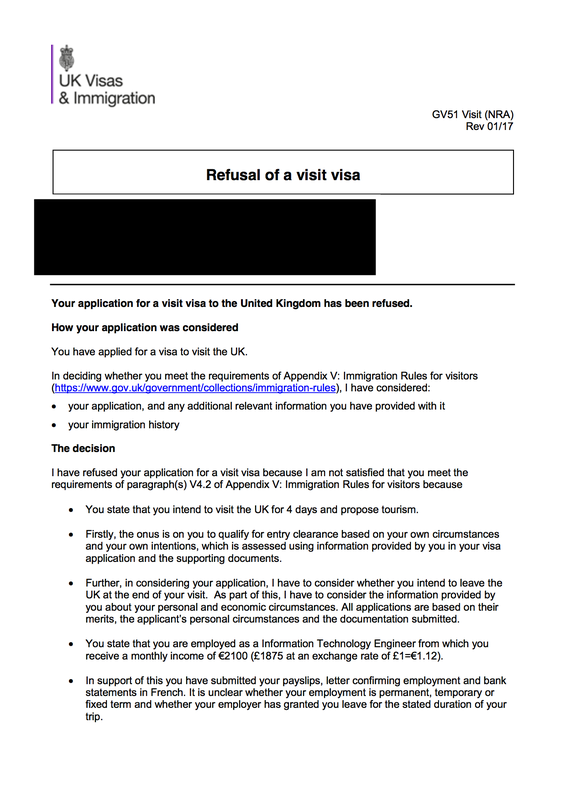 You have not been refused a visa because you proposed to be a tourist for four days (though I accept that a literal reading of the refusal letter suggests you have). Rather, the Entry Clearance Officer is stating the reason you applied for the visa because that determines what criteria you must satisfy. For example, if you had applied for a visa to do business in the UK, you would be expected to provide evidence of what that business is; if you had applied for a visa to make a study visit, you'd need to give evidence of your programme of study. See also the answers at UK visa refusal on V 4.2 a + c (and sometimes 'e'), which explain what you need to do beyond providing translations. Not the answer you're looking for? Browse other questions tagged uk visa-refusals applications translations or ask your own question.